When we first moved to Bend we had a car. Then it became clear we also needed a 4×4 of some sort. Something to get us to the mountain, take us on trials, and the occasional trip to the coast with the kids and dogs. The FJ60 was perfect. Even though its appetite for fuel was rather voracious, it didn’t seem to matter much then. 10 MPG, whatever. The thought of getting an FJ was planted years earlier in Dallas, when my buddy Mark had one. It was a cool blue FJ60. But it wasn’t until we moved to Oregon that I really saw a need for one, so the search for what would soon be our first 4×4 began. After months of checking out FJ’s, one finally stood out – and it was for sale in Portland. It was exactly what I was looking for, and in great condition. I flew up, paid cash and was on my way – kinda. There were a few minor issues after I picked it up, but nothing that some extra time, a few helping hands, and some cash couldn’t fix. We owned it for about five years or so – it was a great vehicle for sure. Many memories, but in the end it was just a mode of transportation – the price of gas was starting to creep up and the amenities of newer more fuel efficient modes of transport were appealing. But still, it would be cool to have one again some day – it was kinda fun getting out and locking the hubs to get into 4×4 mode. Cog Wild provided regular Shuttle runs all summer that would depart from the Cascade Lakes Brewing Co parking lot at 5pm every Tuesday and Thursday. Aaron and I decided to embark on their last one for 2008. It was a short ride up to Swampy, I had a chance to catch up w/ an old friend – original owner/starter upper of Cog Wild – Woody – he drove us up with daughter riding shotgun. There was another rider with us (Peter) who was going to Dutchman, and would no doubt be riding the last hour or so in the dark – sweet. The ride was fun. One of the highlights (next to wiping out a few times) was hearing Aaron scream in terror as he got stung by a bee (he got an ouchy) on the trail. The bee apparently was startled when I rode by and decided to fly into his shorts and sting him in the thigh – nice. Regardless of being stung he rode on – only to endure a whole different type of pain and suffering. Good times, good times. The ride did offer up more than uphill climbs and twisty turns, there were the whoops – everyone loves the whoops – it’s like a BMX course tucked away in the Deschutes Forest waiting for kids of all ages to bomb down them! The views – great views, whether your riding in the dense wooded forest, popping out into an open meadow, cruising through creeks, or just stopping at a shelter to get a glimpse of the mountains. We hit Swampy Loop, Sector 16, the Whoops (Frazzle now), Ben’s Trail, to Phil’s Trailhead. Fun to be had for sure. We ended up riding past the sunset, into the dark and to the 1st place off the trail on the way to town that had cold beer and food – Parilla Grill. My Fajita Steak Burrito was on! But Aaron’s Fish Taco was not happening. He got some other Burrito and that apparently was awesome because it was gone in about a minute – but I’ll leave the food reviews to BOR. ;^). You can track our trip at Everytrail.com. 1st day of school and the kids are actually excited! This will be the 1st and only year they ride the bus together as kids since they are going into 1st and 5th grades. 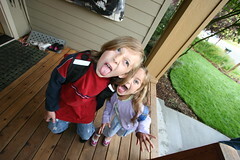 These guys were ready to go with time to spare this morning, so I took some quick pix of them on our front porch – too funny. What will the dogs do now with no one to run and play with during the day? – Sleep more no doubt and thank the district for opening up a huge window for them to catch-up on those much needed dog z’s.